The NSFR is a key Basel III reform to promote a more resilient banking sector by limiting over-reliance on short-term wholesale funding. It is designed to complement the Liquidity Coverage Ratio (LCR) but, whereas the LCR focuses on cashflow behaviour under market-wide liquidity stresses over 30 days, the NSFR looks at the resilience of the asset and liability structure of the balance sheet under firm-specific stresses over one year. The NSFR measures a bank’s Available Stable Funding (ASF) relative to its Required Stable Funding (RSF). Banks will have to maintain their NSFRs at 100% or more. A bank’s ASF is calculated by assigning different weightings (ASF factors) to each of five categories of borrowing. The weightings reflect the assumed stability of the category of funding to which they apply and are a function of term to maturity, type of lender and type of asset. RSF is calculated by assigning different weightings (RSF factors) to each of seven categories of lending. These reflect upon the assumed liquidity of the category to which they apply and are a function of its term to maturity and quality. RSF factors also incorporate an assumption that banks will roll over a proportion of their lending to preserve customer relationships and a desire to ensure continued lending to the real economy by requiring a minimum degree of stable funding for such lending. The following table compares ASF and RSF factors. If a bank funds itself from a category in the ASF column and lends to a category in the RSF column with the same weighting, then the NSFR is 100%. 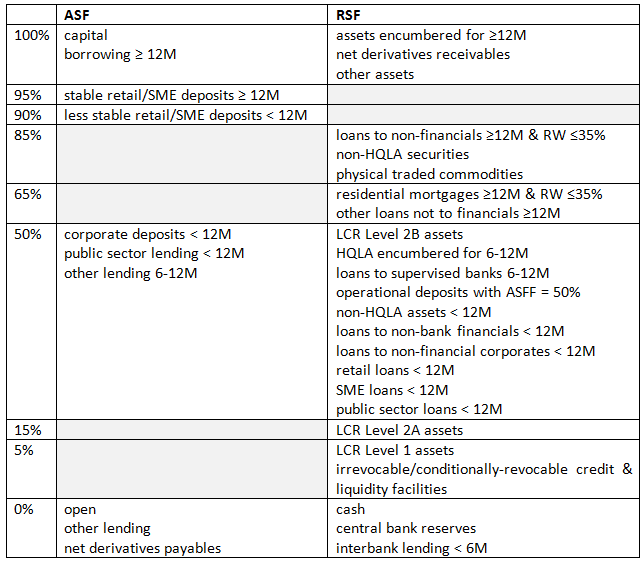 However, if a bank funds itself from a category in the ASF column and lends to a category in the RSF column with a lower weighting, then the NSFR would be less than 100% and there would be a net stable funding requirement, which the bank would need to cover by borrowing from a higher category. Standalone repos are treated by the NSFR as pairs of matched transactions, specifically, as leveraged purchases of securities. This is because collateral remains on the balance sheet of the seller. Therefore, an ASF factor is applied to the cash side of a repo and an RSF factor to the collateral. In contrast to unsecured lending, where the RSF factor depends on the counterparty and term of lending, the RSF factor of a repo is determined by the type of collateral. Moreover, because the collateral on the balance sheet of a repo seller is regarded as ‘encumbered’ (unless the repo is with a central bank), it is subject to enhanced RSF factors. Where the encumbrance (ie the term of the repo) is for more than six months but less than one year, assets which otherwise would have RSF factors of 50% or less, are assigned RSF factors of 50%. Encumbrance of more than one year pushes the RSF factor to 100%. The table below summarises the impact of the NSFR on securities financing, by setting out the pairs of ASF and RSF factors for each combination of funding and collateral. For example, borrowing through a repo for less than six month from a financial institution (top row) against Level 2A collateral (fourth column) is shown as 0:50, meaning an ASF factor of 0% and an RSF factor of 50%. This produces a net stable funding requirement of 50%. Interbank maturity transformation is penalised under the NSFR, unless it takes place within discrete bands: overnight to six months; over six months to one year; and over one year. Thus, if a bank borrows interbank (1) on an open basis or (2) for less than six months and lends interbank for less than six months, the ASF factor is 0% and the RSF factor is 0%. This means that there is no net stable funding requirement. In other words, interbank maturity mismatches are allowed anywhere between overnight and six months. The sample principle applies for transactions within the six month-one year bucket and within the over one year bucket. In contrast, if a bank with the same funding as above lends interbank for more than six months, the RSF factor rises to (1) 50% for loans of between six months and one year and (2) 100% for loans longer than a year. This means a net stable funding requirement of 50% or 100%. Maturity transformation is allowed, if funding is from non-financials. Thus, there is no penalty on lending to banks for more than six months (ASF factor of 50%) when funded with deposits (of less than one year) from non-financials (RSF factor of 50%). The NSFR is also generally neutral towards maturity transformation between non-banks. Borrowing from non-banks gets a 50% ASF factor, if it takes the form of deposits from (1) NBFI for between six and one year or (2) corporates, sovereigns, PSEs and development banks for less than one year. Lending to non-banks for less than 12 months gets a 50% RSF factor. Intermediating between non-banks means no net stable funding requirement. The NSFR encourages borrowing long and lending short. Thus, a net stable funding surplus is created by lending interbank for less than six months (RSF factor of 0%), if it is funded by borrowing interbank for between six months and one year or for less than one year from non-financials (ASF factors of 50%). The NSFR targets bank funding of NBFIs. Lending for less than one year to NBFIs is penalised, if it is funded from banks for six months or less. The RSF factor would be 50% and the ASF factor 0%. The table below sets out the pairs of ASF and RSF factors for each combination of borrowing and lending.